Today, 29th January 2019, at Manipur University' Court Hall, the oath taking ceremony of Manipur University Students' Union, General Election, 2018-19, have been solemnized with Jarnail Singh, Administrator of Manipur University. The MUSU election process was held on the 25th of this month. The New Key Post Members of MUSU are Keisham Lebanan (President, MUSU), Chongtham Birjit Singh (General Secretary), Kenezia Ningthoujam (Finance Secretary), Yumnam James Singh (Cultural Secretary) and Sanabam Thoithoiba Singh (Sports Secretary). 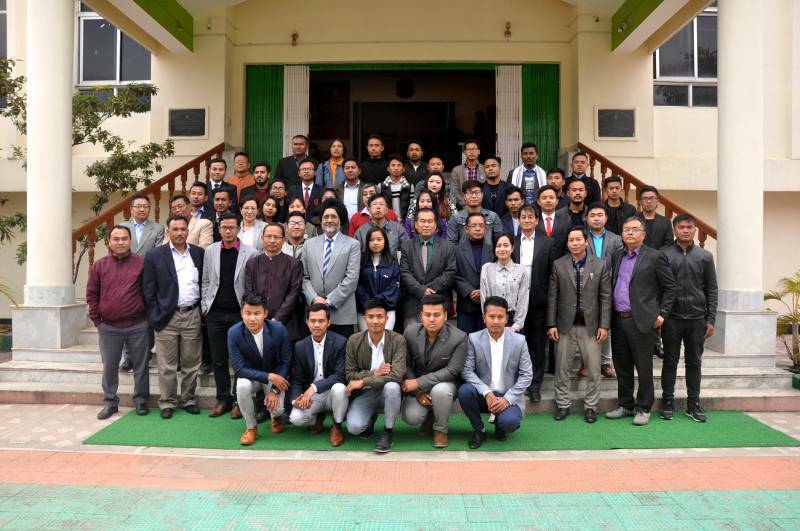 The class representatives are Laishram Bronson Singh (Mathematics), M Peter (Commerce), Nongsaibam Lisan (Geography), Chongtham Roshini (Community College), E Lawrence (History), Haobam Dayan Singh (Manipuri), Anand Thingbaijam (Economics), H.Chingkheiganba Meitei (Sociology), Laimujam Tokyo Singh (Life Sciences), Th. Devala Devi (Yoga), Avy Khundrakpam (Myanmar Studies), Kshetrimyum Suraj (Library & Info. Sc. ), Laishram Premananda Singh (Chemistry), Ph. Saliwan (Human Rights & Duties), Kiyam John Singh (English & Cultural Studies), Julia Yumnam (Linguistics), Loitongbam Premkumar Meitei (Adult Continuing Education & Extention), Thoudam Rejiya (Earth Sc. ), Salam Sanathoi Singh (Polotical Sc. ), Rakesh Ningthoujam (MIMS), Sapam Surchandra Singh (Physical Education & Sports Science) and Nongthombam Suraj Singh (Forestry & Env.Sc.). 2. View Photo Galley regarding the MUSU Election, held on 25th January 2019.